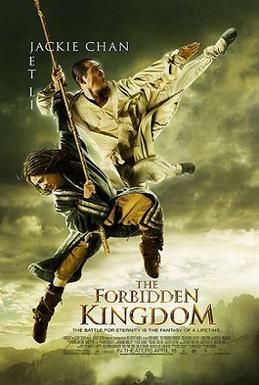 Legendary martial arts stars Jackie Chan and Jet Li come together onscreen for the first time ever in director Rob Minkoff's time-traveling take on the Monkey King fable that finds an American teen transported back to ancient China after wandering into a pawn shop and discovering the king's fighting stick. Once there, the adventurous teen joins an army of fierce warriors who have sworn to free their imprisoned king at all costs. In addition to appearing as the mythical Monkey King, Li will also assume the role of a silent monk, as Chan appears in the role of the monk T'sa-Ho. Famed action choreographer Yuen Woo Ping presides over the fight sequences. What is wrong with you? Never heard of Jet Li? Or Journey to the West? There's something terribly wrong with you. When I try to imagine you, I see greasy hair, dirty clothes, ugly face and huge classes. Am I anywhere near? Sensei-kun since you are an anime otaku you should know "The journey to the west". I only say Dragonball and Saiyuki. The translation of the name Son-Goku is Monkey King. Tetaro-sama wrote: There's something terribly wrong with you. When I try to imagine you, I see greasy hair, dirty clothes, ugly face and huge classes. Am I anywhere near? Pretty weird, I live in middle of nowhere, and it comes here in next month. What he means is: Internets! Downloadz! Lulz! I get most movies weeks before they come out. she's rich but not generous, what now?